The story is told of a country preacher who was well known for speaking in very ostentatious terms. Never mind the fact that his congregants were for the most part simple country folk, most of whom were more accustomed to the forthright and culturally recognizable thoughts and expressions of their everyday lives rather than the imposed circumlocutions of “learned” men. One Sunday, after embarking on a rather drawn out sermon, the preacher mercifully indicated the coming end of his protracted embellishment of a not so well known text with the phrase “And so, in conclusion…”; after which he proceeded to speak for another twenty or so minutes. 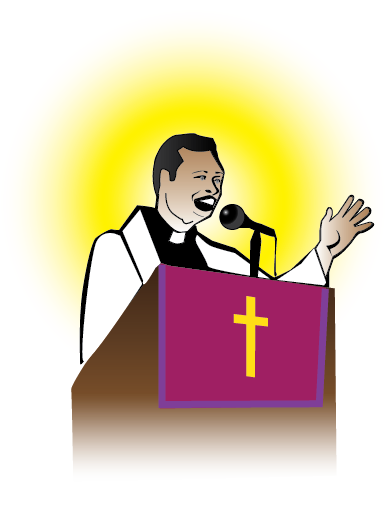 Wearied by the length and verbosity of the sermon, the congregation let out a collective and impatient “Amen!” on what they all knew had to be his final words. Approaching the preacher afterwards, an elderly woman remarked to him about her lack of comprehension of his use of the term “conclusion”. “What” she asked, “did you mean by that word given the fact that you just kept going on and on after saying it. Not grasping the obvious exasperation of this congregant, the man started to explain the meaning of the word in terms he thought the old woman might understand. “Well”, he said, “conclusion means the tail end…” at which the old lady just shook her head, smiled, and walked away. Not too long afterwards as the congregation dispersed, the preacher mounted his horse to depart for home. Indulging a sense of being mischievous upon noticing what could be called a rather remarkable protrusion from the rear of the parson’s horse, the old lady declared quite loudly: “Preacher! Preacher!… there is something protruding from your horse’s conclusion.” At which the whole crowd burst out laughing. “Well said sister!”, came an anonymous endorsement from the crowd. A young and rather creative minister was assigned to serve a congregation that was riddled with numerous issues which impeded its growth. Many who had gone there before him ended up frustrated as to the possibility that this church could be turned around. The common sentiment was that the church was “dead”. Having given much thought to his predicament and the obvious challenge that was before him, the young preacher sat down and carefully prepared his inaugural sermon. In preparation for this service he ordered that a casket be made. Instead of the usual first Sunday communion service, he sent word out that the congregation should come prepared for a burial. This, he told all the leaders and other members of the congregation, was to be a unique funeral service. Arriving at the church that Sunday, no one knew what to expect. There in front of the podium stood a covered casket. No one had died as far as anyone knew, so who was being buried…? Out of pure consternation a great crowd showed up for this spectacle; some wondering aloud if this new preacher was “a little out of his mind.” The church was filled to capacity, as word spread far and wide about the new preacher’s announcement. And they all did; because in the bottom of that casket was a mirror. That church has never been the same since. And is that not our desire…?